Cyclists have raised concerns over their safety in Chichester. Cyclists have raised 'enormous concerns' with the dangers of travelling by bike in Chichester. At the annual parish meeting of the Chichester City Council on Tuesday evening, residents were given an opportunity to voice their concerns and ask questions of electors. Experienced cyclist John Newman, of Maplehurst Road, Summersdale, outlined his fears over 'downright dangerous' roads. He said: "The provision of cycling in Chichester concerns me enormously. I would like to know what the city representatives are doing to promote cycling, particularly concerning safety. "Last night I was coming home through the Hornet, turning right into St Pancreas and I wanted to go left up New Park Road. I would like to know what the safest way to do that is, particularly when the lights are letting us come out of the Hornet at exactly the same time as people coming up Market Avenue. That doesn't strike me as terribly sensible. "Another place that worries me is the roundabout at the end of Oaklands Way. I've had a couple of scares and I speak as a very experienced cyclist." Councillor Anne Scicluna agreed. She said: "I cycle down St Pancreas a lot and if you are going from Eastgate Square, you want to go straight up the road and not round New Park Road. You've got traffic whizzing past on both sides. It's incredibly dangerous and incredibly scary." Mayor Martyn Bell, who chaired the meeting, said the parish council can only 'lobby and pressurise' for changes. He added: "My dream would be for the whole of the Hornet to be pedestrianised down to what was the market area. Even if they reduced the road to one lane from the Hornet to St Pancreas, that would slow the traffic down and create spaces for a rack and make it safer as well. "I'm a cyclist myself and I am very aware of the Oaklands Way roundabout. I understood there was going to be a cycle route that would come down parallel to College Lane but through Oaklands Park, but that hasn't happened. "It would have meant cyclists wouldn't have to get off their bike and go under the underpass or take their life in their hands and go round the roundabout. They brought the Co-op in which actually made it even more dangerous." An agreement was made by Graylingwell Park housing developers to build a cycle route but county councillor Jeremy Hunt, who attended the parish meeting, said he did not think this would go ahead due to opposition from Chichester Festival Theatre and Chichester District Council. He said: “It took us quite a long time to get the agreement to widen the footpaths as the sticking point was when we got to the entrance of the theatre. “We wanted to go round the theatre, and through the car park. Unfortunately that was not agreeable by the theatre or particularly the district council who would not let us put the designated lane through their car park as they said that was too dangerous. “In the end we were at a huge stagnation and as I understand it, it was agreed at that point that the section 106 would be signed off and completed at the entrance to the theatre. There was no way to get to Oaklands Way to put in those particular traffic lights, so that's not going to happen unless something comes forward at a later date." Sarah Sharp, co-ordinator of ChiCyle — Chichester's Cycle Campaign — said that this revelation was 'so disappointing', as it had been 'on the agenda for years'. After the meeting, ChiCycle outlined its stance on the matter after the 'devastating news'. A spokesman said: "We have always said that new development needs proper links and road crossings as well as safe, segregated routes to allow people to leave their cars at home and feel safe while cycling into the city or crossing the road. "New developments go in, but somehow it seems that developers and the council officers are unable to deliver the promised cycle and walking infrastructure. Of course ChiCycle will continue to campaign for safe infrastructure and we will put as much pressure as we can on our councillors to ensure that these promises are kept. People's safety must come first. "It is about making nicer, liveable places that allow people to travel safely on foot or on a bike. Crossing Oaklands Way has always been difficult - it is four lanes of traffic with a lot of traffic and a very busy Coop. I use this junction a lot and I know how essential it is that we make changes to it and reclaim some space from the car. "We are let down by our officers and the planners if they fail to deliver the key part of the route just because CDC and the theatre maybe don't want people in bikes passing over their land on a set route. Who loses out? the people who want to cross the road at Oaklands Way and aren't in a car." 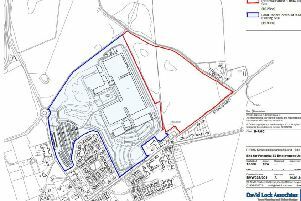 Chichester District Council said a toucan crossing 'has to be provided' across Oaklands Way from Northgate car park 'as part of the legal agreement' running with the outline planning permission at Graylingwell Park. A spokesman added: "This needs to be provided by the time that the 450th dwelling on the site is occupied. The developer, Linden Homes, has not yet reached that level of occupancy for the site, but we are monitoring this to ensure that the crossing is delivered as required in the legal agreement. West Sussex County Council has been approached for comment.